Thai Orange chile peppers grow on compact plants, and are heavy producers. The chiles are slender, the fruit is capped by the calyx and stem and tapers to a point. They can grow up to 2 and a half inches long and mature from a dark green to a deep orange color. Thai Orange chile peppers aren’t nearly as intense as their red cousins, but they are still very spicy. Thai Orange chile peppers have a very fruity taste. Thai chile peppers average 50,000 – 100,000 Scoville Heat Units. The Thai Orange chile pepper is roughly the equivalent to a spicy jalapeno or cayenne pepper. Thai Orange chile peppers are available in the late summer and fall months. Thai Orange chile peppers are a cayenne-type variety of Capsicum annuum. The Thai variety is unique because of its orange-hued fruit. Thai Orange chile peppers are known locally in Thailand as Prik Leung. 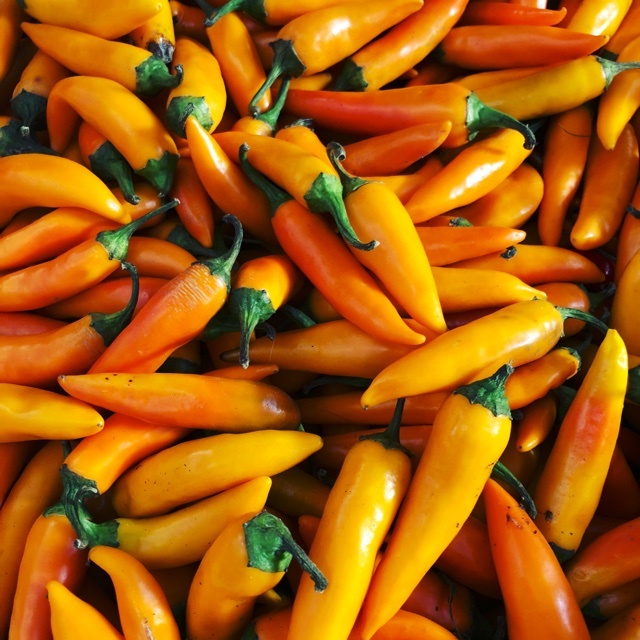 Thai Orange chile peppers contain high levels of vitamin C and vitamin A, along with carotenoids responsible for the bright orange color of the peppers. The carotenoids provide antioxidant benefits. 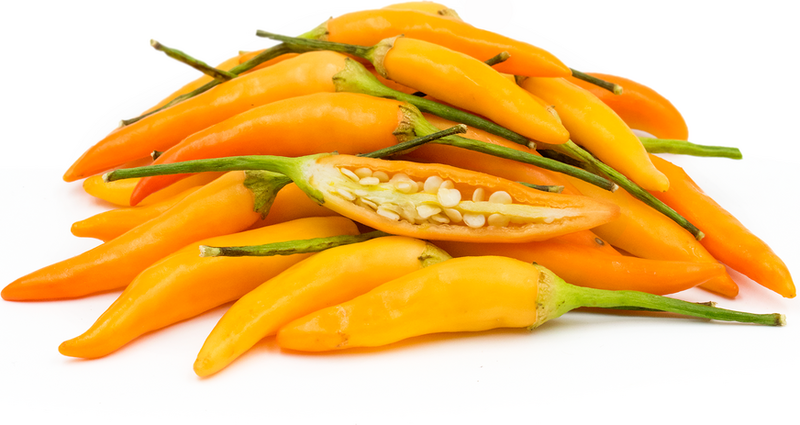 Thai Orange chile peppers also contain potassium, magnesium and iron. Capsaicin, the compound responsible for the spiciness of the peppers, also provides anti-inflammatory and antioxidant benefits. Thai Orange chile peppers contain capsaicin, so should be handled with gloves to avoid the stinging sensation. Rinse Thai Orange chile peppers under cool water and pat dry before preparing. Chopped Thai Orange chiles can be ground in a mortar and pestle and added to sautés or sauces. Slice and sauté Thai Orange peppers and add to chicken dishes or marinades. In Thailand they are used in spicy salads and chile paste for their fruity aroma. Store Thai Orange chile peppers wrapped in plastic in the refrigerator for up to two weeks. Frozen peppers can be stored for up to a month. In Thailand, Thai Orange chiles are mostly used in the dish Pad Phet, pronounced “pad pet.” Pad phet is a stir-fry dish that uses red curry paste and the orange chile peppers for spice and can include any type of protein. The dish is very common in Thailand and is a staple in most homes. Orange chiles are native to Thailand and are not very common outside of Indonesia. All Capsicum annuum peppers are native to Central and South America and were spread to Europe, Asia and Indonesia by Portuguese explorers. Thai Orange chile peppers are often seen displayed in mounds at the local markets in Thailand. 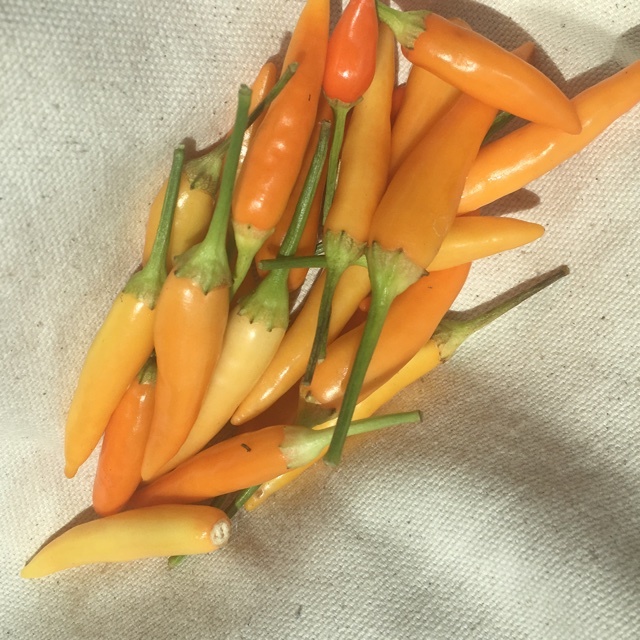 Outside of Thailand, Thai Orange chile peppers can be found through online seed companies or at small farms. People have shared Thai Orange Chile Peppers using the Specialty Produce app for iPhone and Android. Sharer's comments : Thai Orange Chile Peppers spotted at Queen Anne Farmers Market. Lovely in chicken sautés, curry, or even a spiced salad! Sharer's comments : Thai Orange Chile Peppers spotted at Virginia Park Farmer's Market.